The folks at Samsung have released a brand new advertisement for the Samsung Galaxy S II, aka one of the best selling phones in history, showing it off in several places in the world ending up letting us know that it’s coming to the USA soon! It’s big in Europe, it’s big in Asia, it’s big all over the world they say, “and soon it will be big in America.” Is this again some indication that the Samsung Unpacked at IFA 2011 trailers were indeed speaking about something having to do with the Samsung Galaxy S II or an upgrade? We shall see! What this new advertisement shows us is that the device will be here in America soon having been massively successful around the world up unto this point. 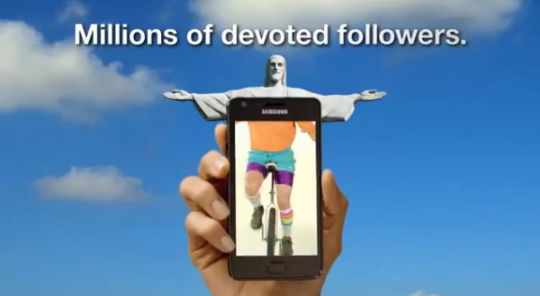 Several placements of the phone are done showing absurd combinations of real people or landmarks and a video of a replacement part on the smartphone. 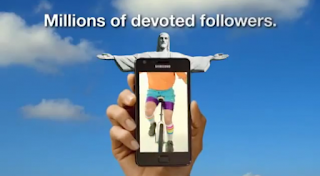 One thing to note that many radical religion-wild viewers might have a problem with is the RIO Jesus being covered up by a unicycler while the words “Millions of devoted followers” on top. Perhaps the Nokia and Wii tags are just to gain some extra attention – but maybe something more notorious is in the works? We’ll be in NYC, New York on the 29th of August to see what all the business is about – stick with us here on ANdroid Community for the sweetest coverage!